The salamander was regarded as one of the most dangerous beasts alive. The Bestiary states, “The salamander is so called because of its proof against fire; it is the most poisonous of all creatures.” The message is clear: if one sees a salamander, go the other way! This cold animal is nothing but trouble. 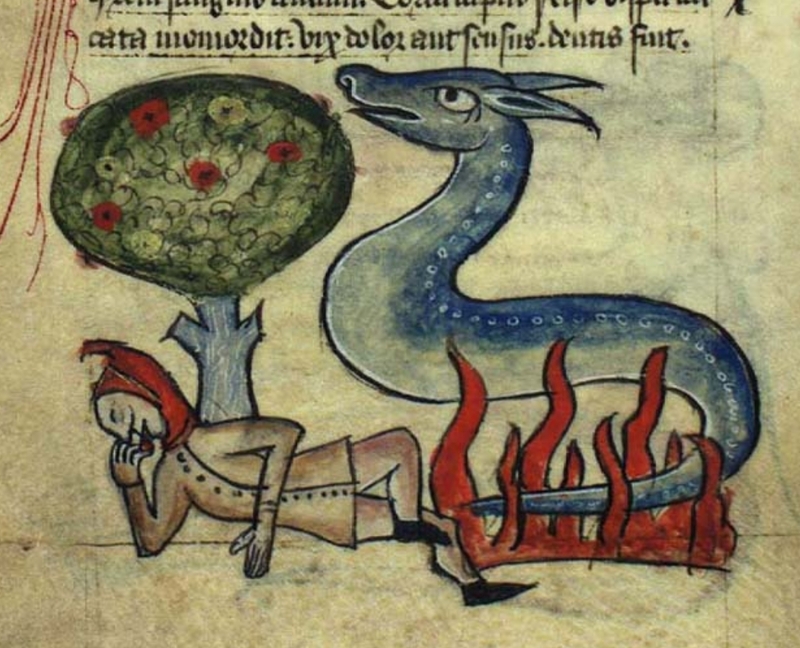 It is thought that the salamander is connected to the biblical parable of Daniel, who emerged unscathed from a fiery furnace. 1. Barber, Richard: translation and introduction. Bestiary: Being an English Version of the Bodleian Library, Oxford. M. S. Bodley 764. P. 194. All original miniatures reproduced in facsimile. Woodbridge: 1999. 2. The Medieval Bestiary. “Salamander.” Published 15 January 2011. http://bestiary.ca/beasts/beast276.htm Accessed 11 July 2018.